Can Bankruptcy Help Me if I am Behind on Spousal or Child Support Payments? By Allmand Law Firm, PLLC|2018-11-15T22:44:40+00:00December 7th, 2012|Divorce and Bankruptcy|Comments Off on Can Bankruptcy Help Me if I am Behind on Spousal or Child Support Payments? Bankruptcy after Divorce: Are You Liable for Debt that Belongs to Your Ex? 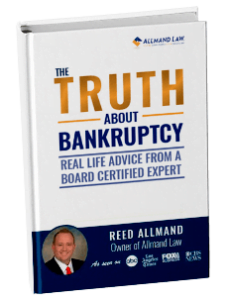 By Allmand Law Firm, PLLC|2018-11-08T17:47:58+00:00November 7th, 2012|Divorce and Bankruptcy|Comments Off on Bankruptcy after Divorce: Are You Liable for Debt that Belongs to Your Ex? What Happens When a Spouse Doesn’t Report All of Their Income at Divorce? By Allmand Law Firm, PLLC|2018-11-19T23:06:12+00:00September 14th, 2012|Divorce and Bankruptcy|Comments Off on What Happens When a Spouse Doesn’t Report All of Their Income at Divorce? What Information Should Be Included in the Divorce Papers? By Allmand Law Firm, PLLC|2018-12-13T10:10:24+00:00September 13th, 2012|Divorce and Bankruptcy|Comments Off on What Information Should Be Included in the Divorce Papers?